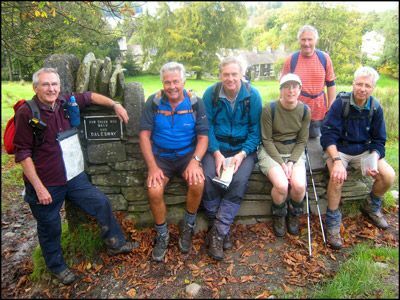 The Dales Way was the choice of route this year and the day dawned fair as seven old hands travelled down by minibus from Cumbria to Ilkley to renew last year’s acquaintance with Brenda at the start. Numbers were reduced due to Jim’s illness and we were also shocked to learn that Valerie had injured herself in a fall and was in hospital. Between us and the first night’s rest in Grassington lay sixteen miles of magnificent walking alongside the River Wharfe. 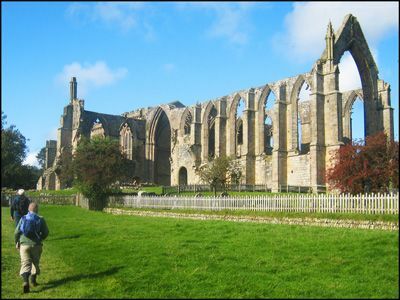 After an easy six miles most lunched in warm sunshine in the region of the impressive Bolton Priory after which the narrow grit stone channel of the Strid was reached and admired without any foolhardy attempts to leap across. Idyllic remained the adjective of the day as company was kept with one or the other banks of the Wharfe past Burnsall and Linton Falls to eventually reach our objective – the Foresters Arms in Grassington. After slaking thirsts some moved on to their digs at the Kirkfield Guest House before we regrouped for an excellent feed at the Foresters. 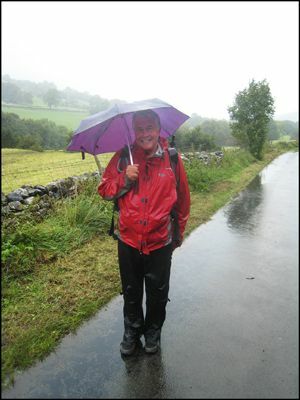 An early night was mandatory as the next day was to be the 24-mile crux of the walk. Breakfast times prevented a dawn getaway but the start in two tranches was still early enough to suffer a bitter north headwind as the Way headed higher on an upland traverse between limestone ledges on its route to Kettlewell. On arriving the first group were joined by Andrew & Anne and forged on, Wharfe-side again, to lunch at Hubberholme while the tail enders grabbed tea and tea cakes before ploughing their own furrow for the rest of the day. Warmer conditions prevailed in the afternoon until we finally left the wonderful Wharfe to head uphill and westwards over bleaker terrain towards lonely Cam Houses. This was initially to have been our night’s stop but we had to settle for a most welcome cup of tea here before pressing on a further three long miles to RV with a roadside taxi transporting us to the fleshpots of the Wheatsheaf in Ingleton. Perfect timing saw the second group reach the roadside just as our taxi returned for their pickup. With the party reunited a great night’s entertainment was in store due to the serendipitous coincidence of the Ingleton Folk Music festival, which appeared to be based largely in the hotel’s bar. Guitar’s, banjos, fiddles, squeezeboxes, penny whistles, and even ‘spoons’ were the order of the evening ensuring a foot-tapping end to the day. 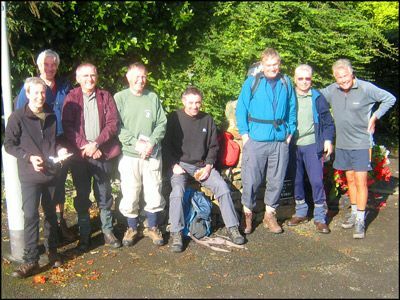 Next morning the party was fragmented again for a shorter day of sixteen miles which headed over into Dentdale to join and follow the River Dee on the way to overnight at the Bull Inn in Sedbergh. Two drop offs at yesterday’s finish point allowed all to press on at their preferred speed in truly awful weather; some to make a run for a dry haven and others to rest awhile in the oasis of Dent’s excellent tea room before braving the deluge again. The rain worsened during the day as we plodged through increasingly flooded fields and minor roads with the rivers rising almost as we watched. Sedburgh saw the planned departure of Andrew, Anne and Will leaving a nucleus of seven to complete the saga. After a pleasant though quieter evening the survivors woke to a diamond day of warm sunshine in a virtually cloudless sky - a complete contrast to the previous day. Although the going was understandably a little soggy underfoot the magnificent river scenery amply compensated for this as yesterday’s precipitation hurtled downstream. The morning’s walk was alongside the Rawthey then the Lune before crossing the motorway near Lambrigg Fell to traverse a myriad of fields and homesteads in little known territory. 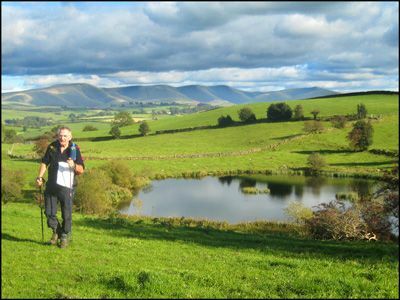 As the Howgills gradually receded more open vistas of the Lakeland hills slowly appeared with especially fine views on offer towards the Coniston Fells, Crinkles, Scafells and Bow Fell. River scenery returned in spades as the Mint, Sprint and finally Kent were each in turn visited briefly. Beautiful Black Moss tarn provided a superb afternoon interlude where most chose to laze for a while in the sun while Jim and Ron hurried on to the pub in Burneside. After scurrying across the busy A6 the rump of the party idled into the village to complete the day’s seventeen-mile schedule, rejoin the boozers and liaise with our transport into nearby Kendal for the night. A celebratory meal was enjoyed at an excellent Italian restaurant in Kendal before we settled for the night prior to the final ten-mile push. Another sun-kissed morning enabled us to enjoy a pleasant stroll along the River Kent towards Staveley after which rolling upland pastures lead unerringly to the finish above Bowness. 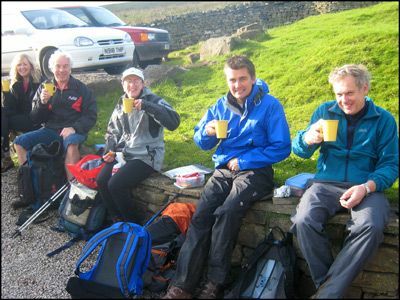 A short hiatus was enjoyed prior to finishing when refreshments were taken at the ‘Troffers’ café at Hag End below School Knott. 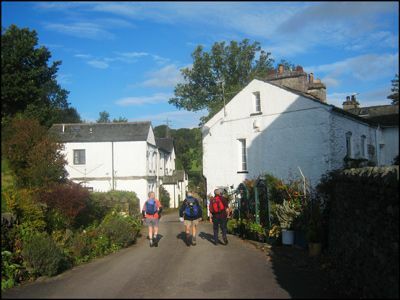 The final task involved dodging the tourists in Bowness on the perambulation upwards towards Windermere station where we eventually dispersed by rail or road with promises to enjoy a similar hike next year.